For country superstar Tim McGraw, this summer will bring two major life events: his eldest daughter will graduate from high school, and he'll embark on a massive North American run, the Shotgun Rider Tour 2015. 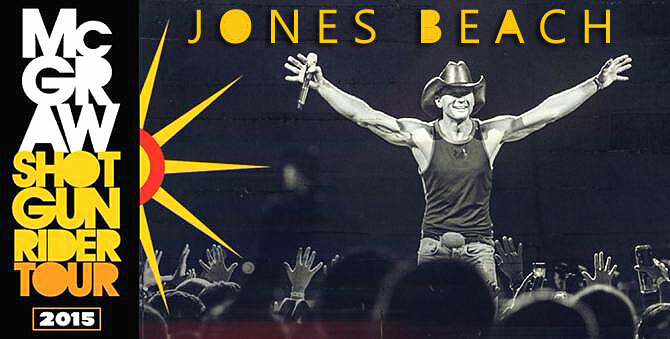 Alongside supporting acts Billy Currington and Chase Bryant, McGraw will hit Jones Beach on June 11. McGraw is still riding high with "Shotgun Rider" at the top of the country charts for the fourth week in a row, and his newest single, "Diamond Rings and Old Barstools," released to radio last week. (See him perform the ballad with Catherine Dunn below.) For the singer, picking favorites from Sundown Heaven Town was rather easy — mostly because he felt pretty amorous about every last one. "When I turned the record in," McGraw tells Rolling Stone Country, "I told [label head] Scott Borchetta that, out of all 18 songs, I didn't care which one we put out, because I like them all that much. When you hear songs that move you that much, you want other people to hear them." Another poignant track — "Meanwhile Back at Mama's," a duet with wife Faith Hill, will have the couple traveling to Los Angeles for the Grammy Awards on February 8th, where they're up for two awards. As much as they love performing together, McGraw insists it's the music, not their marital connection, that dictates when they collaborate. "We make the song motivate the singing together, instead of the singing together motivating the song," he says. Aside from the release of his sci-fi film Tomorrowland, due this spring, McGraw will be cherishing the time in Nashville with his daughter until they both hit the road. "I have a little bit of downtime because it's my daughter's senior year, so I wanted to be home as much as possible," he says. "Of course you hate for them to leave, but, at the same time, you are excited to see what lies ahead of them, and for them to get out into the world." Based on the breadth of the Shotgun Rider Tour, he's clearly ready to do the same.